Make the most of every nook and cranny on your property by elevating them to their full potential. Even the tiniest areas can blossom once they’re given some tender loving care. Diminutive spaces may seem more challenging to design, but don’t let them intimidate you! 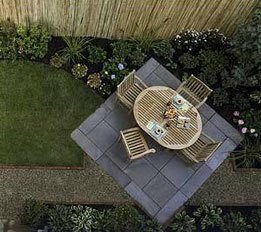 Just because your outdoor space is on the small side doesn’t mean you can’t make a big impact with strategic landscaping. When size is an issue, designing to scale is of the utmost importance. Large features overwhelm smaller spaces, so pay attention to the dimensions of plants, accessories, etc. before committing. Plants grow and spread as they mature. This can be lovely to watch, but it can also be frustrating when a layout is unbalanced by encroaching growth. The easiest solution to this problem is to only add plants to the space that are miniature in stature, or at least well-behaved. Highlight the dimensions that your space does occupy by creating distinct focal points. Choose three that draw the eye so that every inch is appreciated. For example, thoughtfully-placed walls, screens, levels, pathways and trees add interest while highlighting dimension. Height is often a forgotten advantage. Treating an outdoor space like an indoor one is already in style; why not decorate shelves and walls to create vertical interest? When it comes to depth, the strategy is slightly different. Consider the laws of perspective; feature a nearby focal point, like a large, brightly-colored plant, then place smaller plants and objects behind so that they appear to recede into the far-off background, even if it isn’t so far-off. Breaking up a small space into even smaller sections deceives the eyes, making the area actually appear larger than it really is. Diagonal borders or pathways zigzagging across a yard enlarge the space, for example. Instead of focusing on the outermost borders, visitors’ eyes will leap from section to section. This creates a distraction. The variety and interest found within the space can draw attention, instead of the size. Decks, walls, and groups of plantings don’t need to be large to expand an area, provided that they define spaces. As the fashion saying goes, remove one accessory before going out. This philosophy can also be applied to small space landscape design. Pinpoint the necessary functions that your space needs to fulfill then eliminate the extraneous. Defined spaces expand a tiny area, while clutter can crowd it. Rotate decorations season to season instead of displaying them all at once. Think outside the box, or space. Store extra seating and accessories inside when they aren’t being used. If that isn’t possible, get creative. Free up as much space as possible. That way, every spot can be used. No room for a traditional fruit or vegetable garden that’s set off on its own patch of land? You can still enjoy produce, even if it’s planted in more unconventional spots. Containers and raised beds can accommodate many types of growth.